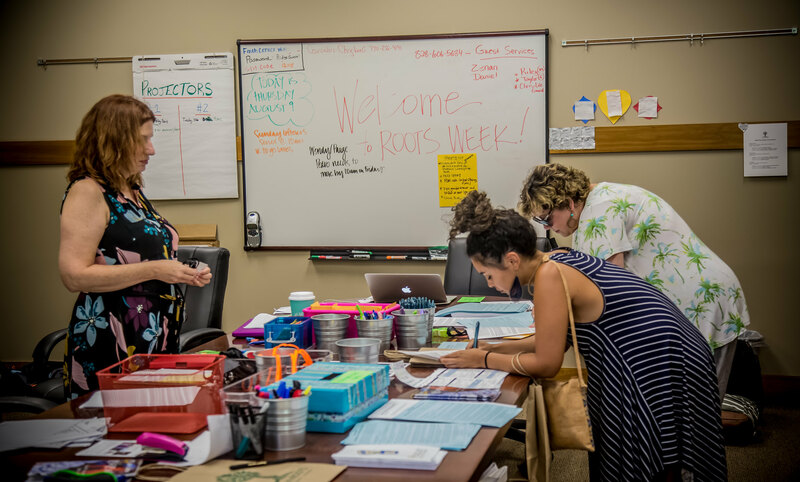 It takes A LOT of people-power to make ROOTS Week run. We’re looking to hire amazing individuals to fill out the ROOTS Week Team! Team members receive complimentary registration, small stipends, and possible travel assistance when available. If you are interested please send a resumé and cover letter to rootsweek@alternateroots.org by Friday, April 26, 2019. Since ROOTS Week is such a unique gathering, preference in hiring will be given to applicants who have attended ROOTS Week previously. The ROOTS 101 Coordinator will coordinate with ROOTS’ Operations and Programs staff to develop and facilitate ROOTS 101 and 201 sessions. 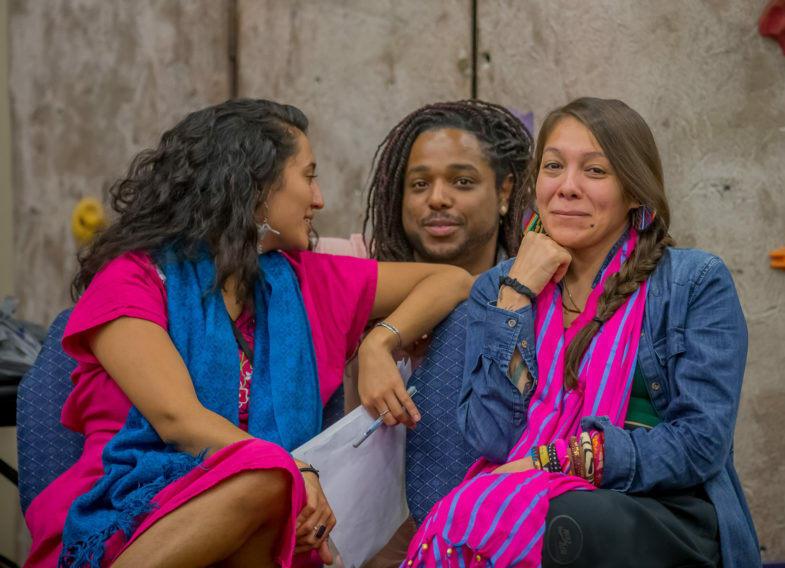 These sessions introduce new (or nearly new) attendees and members to ROOTS’ history, programs, and practices. Requirements: Organizational and communication skills, and an understanding of Alternate ROOTS. Christine Gautreaux, 2018 ROOTS Week Camp Counselor. Photo: Melisa Cardona. The Accessibility Coordinator will coordinate with ROOTS’ Operations staff to organize and manage the Accessibility Co-op team. Duties include ensuring that accessibility needs of ROOTS Week participants are being met, prior to and throughout the event. The captain will meet with and support participants that have communicated to ROOTS that they are in need of additional support (such as golf cart transportation, meal delivery, etc.) and coordinate the Accessibility Co-op team to meet these needs. Requirements: Dependable and organized, experience working with people with varying abilities, volunteer management experience is a plus. The Youth Village Coordinator will work with ROOTS’ staff to develop and curate youth activities throughout ROOTS Week. Activities will include art-making and creative play, as well as time for reading and reflection. Requirements: Experience with, and passion for, working with children ages 5-13 years old, and developing an arts-based curriculum. Must pass a background check. The Camp Counselors serve as ambassadors for emotional health to the ROOTS Week population. 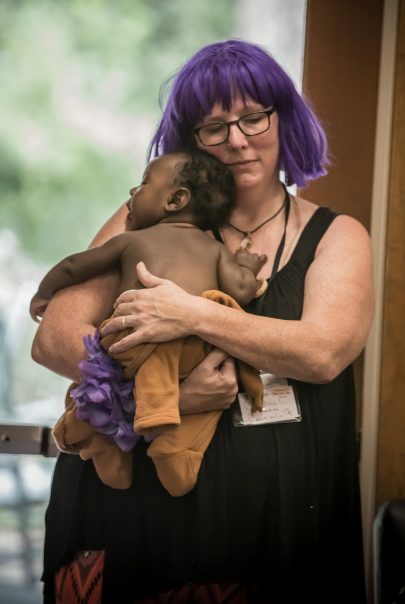 This resource person participates in all-conference sessions as able, serving as an emotions monitor, and suggesting we take a breath or break when appropriate. Additionally, this practitioner is available for private meetings with individual ROOTS Week participants. These meetings are offered pro-bono to participants and are considered to be a part of the service of ROOTS Week. Requirements: A licensed degree in mental health (MSW, LCP, etc.) or other established professional healing modality. A commitment to, and familiarity, with ROOTS’ mission. The Late Night Coordinator will work closely with ROOTS’ Programs Manager, Wendy Shenefelt and Late Night Team. This person will assist with identifying and securing hosts for each Late Night, provide orientation and guidance for Late Night hosts, and will post Late Night Meeting Agreements. The Visual Arts Coordinator will facilitate safe & respectful installation and de-installation of visual arts work in careful communication with the artist, ROOTS staff, and Lutheridge. This person will communicate the specific needs of visual artists with the leadership team members, and will create the schedule for visual artists at ROOTS Week in conjunction with other staff. The Visual Arts Coordinator ensures that visual arts work is not kept in silos or presented as separate from the greater work of the organization. The Health and Wellness Coordinator will serve as an ambassador for emotional health and encourage and support ROOTS Week participant wellness through healing practices for the mind, body, and soul. They will coordinate with ROOTS’ Programs Team staff and Camp Counselors to organize and manage the Health and Wellness work co-op team. Requirements: A commitment to and familiarity with the ROOTS mission and how that shows up in our healing and wellness. The ROOTS Week Registration Assistant will work alongside ROOTS’ Operations Manager and Administrator in the Registration office at ROOTS Week. Duties include greeting and checking in ROOTS Week attendees, answering questions and assisting attendees, processing payments for fees, memberships and donations, and coordinating on campus golf cart transportation with Hospitality and Accessibility Captains. The Registration Assistants will work approximately 3-4 hours per day in the office. Requirements: Dependable and organized, good people and interpersonal skills, willingness and ability to drive a golf cart, quick thinker and creative problem solver, ROOTS Week experience is a plus but not required. The Green Team Coordinator serves as the superhero/heroine for green practices at ROOTS Week. This person organizes and leads composting, recycling, and education activities around green practices for ROOTS folks. As Lutheridge does not have its own compost, the captain will work in advance of ROOTS Week to secure the off-site compost facility, ensure that ROOTS has all of the needed equipment (garbage pails, etc. ), and create a schedule for work co-op participants. Requirements: A working knowledge of green practices, especially for large groups. A passion for teaching and mentoring others, and leading both small and large groups. Good organizational skills.